The last few months have been a busy time for our คณะวิจัยงูสะแกราชฯ – Sakaerat Conservation and Snake Education Team neighbours here at the Sakaerat Biosphere Research Centre, as its been the King Cobra (Ophiophagus hannah) breading season. At this time of year, the male Kings Cobras, fuelled by a burning desire to meet the lady of their dreams, are more than capable of moving several kilometers at pace cross country in their search. The hardy trackers on the SCSET team have been dragged here, there and everywhere by their lusty males but as usual have done a great job in keeping tabs on them. Even for royalty there’s a correct way in which things are done, a male can’t just go steaming in for a bit of wham bam thank you ma’am action, without first seeing off his competition, and there is always plenty of that around. Now, as I’m sure you all know the King Cobra is the world’s largest venomous snake, so when the hormones begin to course and carnal desires stir, biting and envenomating one another just would not do, especially for one so regal. Another way is needed and being the intelligent and sophisticated animals they are, the King Cobras have come up with a far more civilized, graceful and sophisticated form of male to male combat. As can be seen in the amazing photos taken by Bartosz during his time as a guest of Gowri Shankar at the wonderful Kalinga Centre for Rainforest Ecology. The King Cobras engage in a wrestling match in which they entwine their long bodies and attempt to push down and pin their opponent to the ground. Such battles can last for several exhausting hours particularly if the males are evenly matched, but with luck to the winner goes the spoils of war, and a steamy night of passion with the lady who inspired their desires. For the looser, well at least such a civilised form of combat means that he lives to fight another day. It’s not just the SCSET team that have their work cut out for them over the mating season. The rescue teams around Thailand like that of หมี กู้ภัยอุดมทรัพย์ อ.วังน้ำเขียว here in the area of the Sakaerat Reserve also have a busy time during these few months. The rescue teams many of which now contain skilled snake handlers having attended one of the SCSET rescue team snake handling courses, deal with most of the snake calls from the public, often getting call outs from concerned villagers when the one track minded snakes, start finding their way in and around people’s properties and homes in the search of a female. Thankfully, due largely to the great SCSET outreach work headed up by Prapasiri Sutthisom, villager’s perceptions of snakes around the area are starting to change slowly, and their first reaction more and more these days is to call the rescue teams or even the station itself to come and remove the snake rather than kill it. Despite all the extra hard work for SCSET following the tracked King Cobras, all this movement does have some benefits for the snake research teams based here at the station. During this time, we ourselves on the Sakaerat Najas Project were able help and support our neighbours by finding and capturing two King Cobras whilst conducting active snake surveys. A feat which is very rare indeed with such an intelligent and cryptic species such as Ophiophagus hannah. Both animals have been passed on to SCSET, and the valuable data from these snakes is now included in their important work focusing on the research and conservation of the species within the Sakaerat Biosphere Reserve. On behalf of the Sakaerat Najas Project, a huge shout out and thank you goes to the Sakaerat Conservaton and Snake Education Team (SCSET). Over the last few weeks the SCSET team have played a significant role in increasing our sample size by bringing in two new Naja siamensis (NASI021 and NASI022) and a new Naja kaouthia (NAKA017) all within a week, and all of whom have joined the burgeoning list of tracked snakes on the Naja Project. Not satisfied with that, whilst out tracking one of their King Cobras, SCSET trackers recently came across a second Naja kaouthia, and managed to capture NAKA018 for us. From their account of the event, NAKA018 was simply cruising along the dirt road in a eucalyptus plantation when they encountered him, and it seems all they had to do was place a bag in front of him and he kindly obliged by making his own way into the bag. Who knew it was so simple! Unfortunately, however, due to the distance of his capture site and the fact that he’s a male, the decision was made not to track NAKA018. Therefore, after he was processed allowing us to take his biometric and genetic data enabling us see how he grows and develops should we ever run in to this most co-operative of snakes again. Bart and I, along with Jessie, a new member of the SCSET team and one of the guys who captured him, set off on our Kawasaki bikes to the plantation so he could be released. As we got to the capture location the wide-open space within the plantation gave an excellent opportunity for a few photographs, and after a quick photo shoot he was on his way back into the forest. There was an hour or so of daylight left as NAKA018 departed, and as I had never been to this part of the station it was decided we should go for a quick ride around. We made our way through the plantations and grasslands stopping off here and there to get off the Kawasaki’s and have a mooch around on foot, but in all honesty seeing very little. Finally, we headed off to one last spot by small pool before we would head home. Almost as soon as we’d got off the bikes and headed out in different directions on foot, I got the briefest of glimpses of a snakes tail disappearing into the undergrowth about 60 m down a steep sloping track. SNAKE! I shouted before running down the slope closely followed by Jessie and Bart. It was only as we got closer did we realise it was a King Cobra, and a big one at that. Seeing us, the snake took off and the three of us gave chase sprinting at full speed through the plantation just to keep up. 70 metres and an epic and intense 15 minutes later Bart had subdued the snake and he was in the bag safe and unharmed. 3.2 m King cobra Ophiophagus hannah displaying defensive hooding behaviour at capture. 3.2 m King cobra Ophiophagus hannah displaying defensive, hooding behaviour at capture. He was indeed a big snake, measuring at 3.2 metres and weighing over 6 kg he was a fine specimen of a King Cobra. It was hardly a surprise when the SCSET team incorporated him into their study, and as of his release on the 8th April OPHA029 became the latest King Cobra to be tracked in the Sakaerat Biosphere Reserve. The very next day and a call comes through to the station from the local Rescue Team. They had just captured a King Cobra, and so once again Bart and I were on our Kawasaki’s heading out of the station to meet up with them. This time at just few centimiters under 4 metres long and weighing in impressively at over 8.5 kg, OPHA030 was a mighty beast. So much so that unwittingly Bart and I found ourselves on the local TV news. Transferring captured King Cobra Ophiophagus hannah into the bag. This scen made its way to TV news. The snake was transferred into a bag for transportation back to the station and delivery of yet another King Cobra to SCSET. Unfortunately, it was deemed to be from too far away for the team to consider it for the study but it was certainly a magnificent snake. Just a few days later and once again we could help our neighbours at SCSET. This time it was Anji and her new Boiga cyanea Project. As we made our way out of the station at night after heavy rain, we were lucky enough to come across a beautiful Boiga cyanea, which was, untypically for this arboreal loving snake, crossing the road. As full grown adult at 1.5 metres its large enough for inclusion in Anji’s project and will become just the second snake in her exciting new study. Finally, with two King Cobras delivered, and a Boiga cyanea, our debt was paid in full. Anji with new Boiga captured by Curtis. 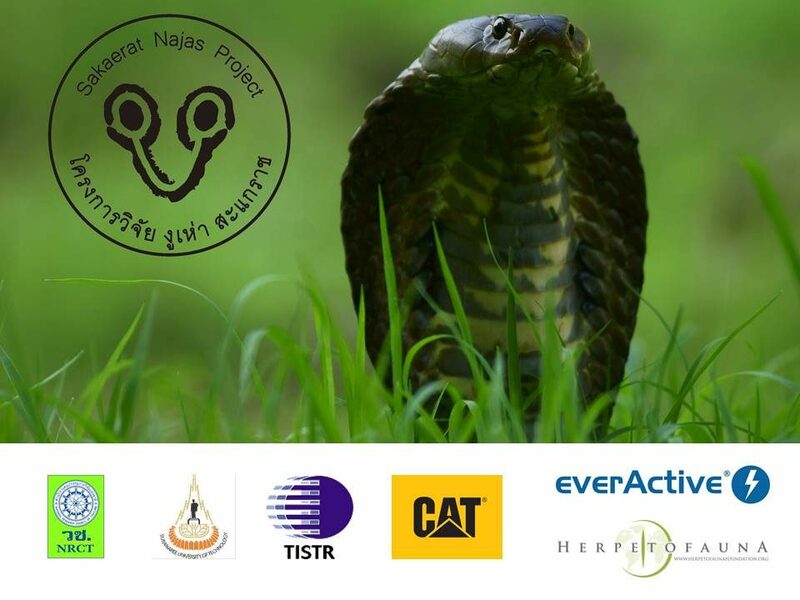 With the great collaborative efforts of SCSET, Sakaerat Najas Project and the Rescue Team’s co-ordinated by Mr. Mee, the future looks bright for snake conservation in Sakaerat. Photo with local Rescue Teams, SCSET and house owners after safe King Cobra removal.